We hold then that God is a living being, eternal most good; and therefore life and a continuous eternal existence belong to God; for that is what God is. Now this definition would appear at first glance to be wholly appropriate to any monotheistic definition of God. It would seem to be the classical definition of God’s nature that we find in Judaism, Islam and Christianity. Perhaps this should not surprise us, since the source for this classical definition is Greek metaphysics, and Aristotle in particular, first of all through the Arab scholars, and then later through the Jewish and Christian writers. And yet if we read book Λ of the Metaphysics closely we will be able to see that there is a great difference between Aristotle’s proof of God’s existence and the monotheistic experience of God, even though monotheism itself will attempt to use Greek metaphysics to give a rational basis to faith. It is not at all certain, when you look at the details, that monotheism and Greek philosophy quite fit together (and it these differences, however small, that will interest us in this course). You can look at this in two ways: that monotheism is beyond philosophy, or more negatively, if you think religion must have a rational basis, then philosophy cannot in the end give a rational justification to monotheistic religion, and thus religion must be irrational and superstitious. Book Λ begins with substance, which could be said to be the general topic of the Metaphysics, since, and this is rushing it a bit, substance is Aristotle’s definition of the meaning of being in general: everything that is, is a substance. But the question of substance here, at the beginning of the book, is a particular one: ‘our inquiry is concerned with substance: for it is the principle and causes of substance that we are investigating’ [1069a18-19]. ‘Principle’ can also be translated as ‘origin’. In Greek, this is ἀρχή. Thus, the question of book Λ is a particular question about substance. It is asking about the origin and cause of substance. But what substance are we talking about? Are we talking about a particular substance within the world, as when a child asks a parent where babies come from, or are we asking about the origin and cause of the universe itself, and thus the primary philosophical question as to why there is something rather than nothing; that is to say, the reason why the universe as a whole exists. What Plato and Aristotle have in common, and which is also shared with other Greek philosophers, and most notably the Pre-Socratics, is a commitment to a rational explanation of the universe. What is the fundamental and basic principle of the existence of the universe? Does the universe just happen by chance or is there a reason for its existence? To argue that it happens by chance would be ultimately to give up any rational explanation of the universe altogether. To say that it exists by chance is not give a reason for the universe, but to give up on reason altogether. Equally if one is committed to a rational explanation of the universe, then mythic or religious stories about the creation of the universe will not do either. For they, precisely in the manner in which they present themselves, are only stories and not rational explanations. This does not mean that there is not a rational core at the heart of these myths, but it is the aim of the philosopher to find out what this nucleus is, and to give it a rational explanation. One way of understanding what Aristotle is doing is that he is pushing this rational explanation to its ultimate conclusion. Aristotle tells us that we must distinguish between 3 kinds of substance: ‘Now there are three kinds of substance. One is sensible [αἱσθητόϛ] (and maybe either eternal [ἀίδιος] or perishable [φθαρτός] […] Another is immutable [ἀκίνητος]’ [1069a30-34]. We might rephrase the question of Book Λ, then, to what is the relation between these different kinds of substance: perishable, eternal and immutable substance? The first and important distinction that we need to emphasise is that Aristotle’s concept of the universe is not merely a split between the finite, on the one hand, and the infinite on the other, or the sensible and the intelligible; rather the sensible realm is itself split into two. This is why there are three kinds of substance. Again this is one important reason why Aristotle’s universe and the monotheistic one, at least in its orthodox guise, cannot be mapped totally one on to the other. For in the latter, the universe is split into two (or better, the universe itself is distinguished from an ‘extra-universe’ domain that is transcendent), between the finite and the infinite, the former being non-eternal, or perishable to use Aristotle’s terminology, and the latter eternal. That we are faced with 3 substances, here, rather than just 2, already shows us that we not in the monotheistic world view. For Aristotle, the universe as such is eternal, and does not require a first cause to come into existence. Of course for monotheism this would be unthinkable, for this would deny the perfection of God, since there would be something outside independent of God’s existence. The eternal world, the universe, already exists for Aristotle. It is not issue for him to explain its existence. Rather, as we shall see, the problem for him, is how to explain its motion. To understand why Aristotle believes there is eternal sensible substance we need to be aware of conception of the universe that he had at the time. What is important is that this is a scientific picture of the universe, and not a mythical or straightforwardly religious one. It is Aristotle’s science that requires the supplement of theology, and not his theology, science. In other words, God for Aristotle is a necessary hypothetical deduction of physics, and more specifically astronomy, and not something that one would pray to or make sacrifices for. The latter belongs to the human culture and not to the structure of the universe and would properly be the object of study of history or poetry. Aristotle’s universe has three levels: at the centre of the universe there is earth, which is the mundane or sublunary world. On earth, there is only perishable substances – plants and animals to use Aristotle’s example. What Aristotle means by perishable sensible substance are those substances that are generated and destroyed in the constant cycle of life and death to which man also belongs. Above this sphere are the heavenly spheres of the sun, moon planets and stars. These substances, unlike the perishable substances are eternal, for they travel in an infinite circular movement without beginning or end. The third and final kind of substance is immutable substance, which unlike both sensible perishable substance, and eternal substance, is not moving (ἀκίνητος means ‘no motion’ and thus ‘unmoved’ or ‘motionless’), and for this reason must be considered as being separate or apart from the other substances. Aristotle’s universe should be seen as continuum of causality. Here on earth one perishable substance causes another perishable substance to be either generated or destroyed. And yet without the eternal substances the perishable substances would not exist. For without the eternal movement of heavenly spheres there would be no life on Earth (the movement of the sun causes the movement of seasons, which is the origin of the succession of generations here on earth). The relation between the sublunary world and the heavenly sphere is, for Aristotle, the subject matter of physics. What does not properly belong to physics is the other relation between the heavenly spheres and immutable substance. If perishable substance requires eternal substance and the argument is that it must require eternal substance for without it there would be no time, and without time there would be no change, see 1071b5-12), then why does eternal substance require immutable substance? Could they not, for example, move themselves? Why should they require some other motion in order to move? To answer this question we have to understand how Aristotle understands change (or motion as he calls it) from the Physics. He repeats the argument of the Physics in book Λ of the Metaphysics. Change is change from some subject to some object by means of an agent. The wood changes to ash by means of fire. The agent is that which causes the change or movement. There are for Aristotle four kinds of change: change in substance, quantity, quality and place (see, 1069b8-15). These four kinds of cause can occur also in two different ways: either by art (the carpenter makes the wood into a table), or by nature. In the first case something is caused by something else, and in the latter change is self caused. The other two causes are negations of these two: chance or spontaneity (see, 1070a4-9). The relation between the agent of causality and the subject of causality must be understood, for Aristotle, through the distinction between potentiality and actuality. Thus, the substance that is changed must have the potential to be that substance that it is changed into. In other words, if wood did not have the potential to be ash, it could never actually become ash: ‘Everything is generated from that which is, but is potentially and is not actually’ 1069b19-20. And yet, what is potential can only be actualised by another actuality. There must be something that causes a potentiality within something to change into an actuality, and that cause must in the end be something actual, otherwise we would only have an infinite chain of potentialities and nothing would be actual. We can see, therefore, that Aristotle’s physics, his conception of change or motion, actually necessitates the existence of an ultimate cause, for without it no substance would exist at all, since, nothing, so to speak would be actualised. How does the same argument, however, fit with the notion of the eternal substances? For are have they not always existed and therefore do not need to be brought into exist? Nonetheless, Aristotle criticises those philosophers (and he names Plato and Leucippius) who simply assert that there is eternal motion without questioning why there is such a motion (1071b32-35). There can only be two answers to this question: either the eternal spheres are self-movers or they move themselves. But even if the eternal spheres move themselves, then they can only do so potentially, for they must be some cause that causes them to actualise this potentiality, and this cause must be a pure actuality, for if it were a potentiality, then the universe would only potential exist, which is impossible. It is as this precise point that Aristotle’s argument diverges from Plato. As we have already pointed out, what is common to them both is a rational explanation of the origin of the universe. Why does the universe exist rather than nothing? Physics and astronomy show us that the universe has a rational order. So the question then becomes why is the universe rational rather than irrational? If we reply that this is a matter of chance, then we are saying that the rational has its source in the irrational, which would mean, in the end, that the rational is irrational. The question is, then, what is the rational source of the rational. The rational source of the rational is rationality itself. The word that both Plato and Aristotle use to express the rational basis of the rational is νοῦς (nous), which we might translate as ‘reason’ or ‘thinking’. Of course when we think of thinking we think of someone thinking, as though the universe came into existence becomes someone thought it into existence (this is a particular way of thinking creation, for example, which is absent in Aristotle’s account). This is not how Aristotle thinks of νοῦς. It is the virtue of the universe being rational as such. When we look at the universe we see that if follows regular laws. The sun, stars, and the planets move in regular movements in the sky, and the seasons follow one another here on earth. It is this regularity or continuity that is the meaning of νοῦς. What Aristotle is doing in the Metaphysics is purifying this principle of any anthropomorphism. To think of the rational order of the universe as a self-moving soul is to still picture it in human terms, as though it were imposing order on chaos from the outside. For Aristotle, on the contrary, the universe is immanently ordered. If we were to think of νοῦς as a self moving, then we have to provide an argument as to why it moved itself. I might move myself towards the kettle to make a cup of tea, but there must be a reason for me to do so (ultimately this reason would have something to do with my body, which is thirsty). A self moving mover, therefore, has the potenitial to move, but to actualise this move, there must be a reason to do so. If we imagine the origin of the universe to be a self moving, then there would have to be an exterior reason why such being would create the universe, in the same way that we need to explain why I moved towards the kettle. For Plato the first mover cannot act without changing itself, but this would involve an infinite regress (what causes this change, and so on). To solve this problem, Aristotle separates movement and activity. There can be a pure activity that does not require the agent to change. It is this pure activity that is the unmoved mover of the origin of the lawful universe. Self movement, for Aristotle, still requires a potential to move and one would still have to supply a reason for the actualisation of this potentiality. A self-mover, then, could not be an ultimate explanation. Let us summarise Aristotle’s argument before we explain what this pure actuality is. The eternal movement of the heavens is a fact. It is observed and explained by physics and astronomy. But we need to postulate another kind of substance that causes the movement of the heavenly spheres. This third kind of cause must itself be eternal, but also, unlike eternal sensible substance, it must be a pure actuality; that is to say, that it itself must not be actualised by any higher kind of substance. For without postulating this pure actuality we would only have potential movement: ‘There is something which moves without being moved; something eternal which is both substance and actuality’ [1072a24-26]. The only questions that remain is how this immutable substance causes the eternal substance to move, and what a pure actuality might be. This is the proper subject matter of theology in Aristotle’s sense. It is clear that is far more restricted than any monotheistic theology in the classical tradition, which is concerned not merely with a rational explanation of the universe, but also with a belief in a personal God. Even in this restricted theology, however, we shall see that Aristotle’s definition of God, which from the quote that begins this lecture would appear to have similarities with the monotheistic definition of God, is in fact not at all like this monotheistic God. The most important lesson to learn from reading book Λ of the Metaphysics in detail is to see that relation of the immutable substance to sensible substance is not at all like the relation between the Creator the created in monotheism. The unmoved mover is not God in this sense. The first way to see this is that Aristotle makes it quite clear that the causal relation between the unmoved mover and the heavenly spheres is not an efficient one. The unmoved mover does not cause the heavenly spheres to move in the sense that an architect causes the house to exist. And yet efficient causality is precisely the way that Christian natural theology conceives of the relation between the creator and the created, for unlike Aristotle the universe is eternal. If the unmoved mover does not move the heavenly spheres efficiently, then how does it? Aristotle is very clear about this – in terms of final causality. For it is only in terms of final causality that one can conceive of substance that is unmoved and yet causes motion. The unmoved mover is therefore the object of desire of the soul of the eternal substance: ‘it causes motion as being an object of love, whereas all other things cause motion because they themselves are in motion’ 1072b3-4. Desire itself, for Aristotle, is subordinate to thought, for without being able to think something as desirable then one would not be able to desire it – desire, as Gerson rightly explains, is a ‘cognitive activity’. Thought itself is moved by the intelligible, therefore the ultimate cause must be pure intelligibility. What is this prime mover? Since it is actuality without any potentiality it must be identified with the highest kind of actuality that is thinking. We need to be very careful here. God for Aristotle does not think thoughts, for this thought are potentialities, for one could always think something else. God must think that which is most divine and that which does not change and that is pure intelligibility, or mind God is mind thinking itself thinking, which is in the end Aristotle’s definition of God: ‘thinking thinking thinking’ (ἔστιν ἡ νόησις νοήσεως νόησις) 1074b35. 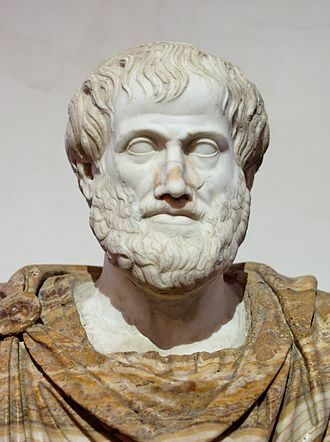 For a very schematic account of Aristotle’s metaphysics, see our lecture ‘Aristotle’. Because Aristotle rejects Plato’s account of separation (that the form of gold exist separately from instances of gold) does not mean that he rejects all separation. The heavenly spheres are separate from sublunary world, as the immaterial is from the material. See, Stephen Menn, ‘Aristotle and Plato on God as Nous and as the Good’, The Review of Metaphysics, 45 (1992), 543–73. Lloyd P Gerson, God and Greek Philosophy: Studies in the Early History of Natural Theology (London; New York: Routledge, 1990), p. 124. You are currently browsing the archives for the Philosophy and Religious Thought category.